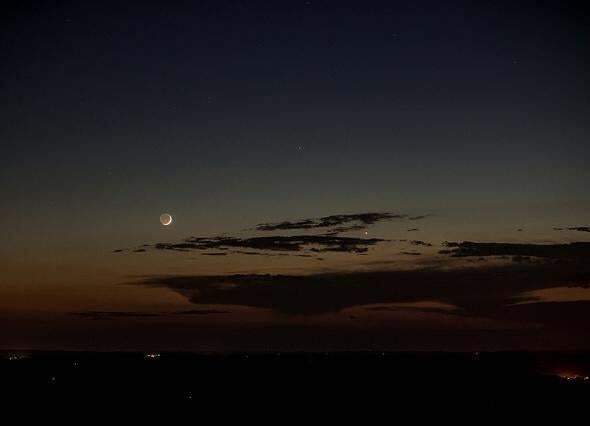 Moon and Andromeda: Relative size in the sky. Sometimes I wind up having to debunk viral pictures or videos getting spread around, too, which are very difficult to extinguish. That’s why I’m pretty happy to be able to write about one that’s actually pretty much correct! Composite photo by Tom Buckley-Houston; see below for original picture credits. And I have to say, that looks about right to me! 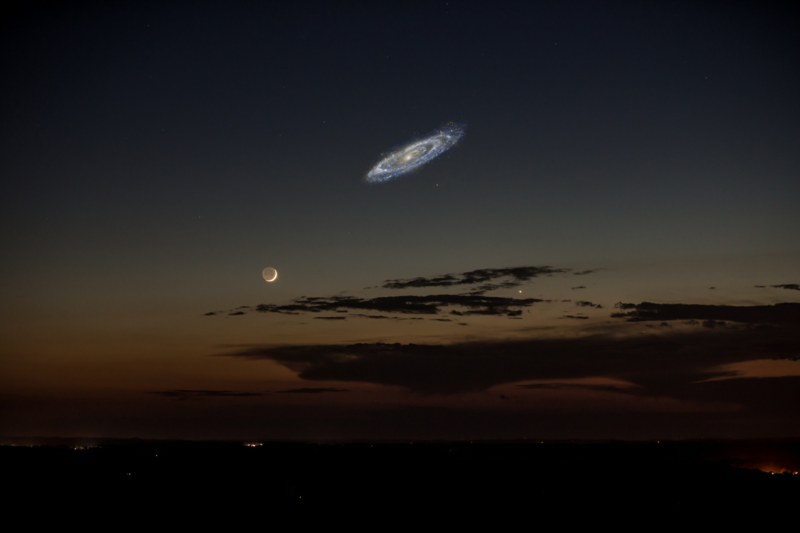 Andromeda is one of the very few galaxies you can see with your naked eye from a dark site. It’s easy in binoculars, and if you use a small telescope, the galaxy fills the eyepiece. However, that’s just the core, the nucleus, of Andromeda. Like the Milky Way, Andromeda has vast spiral arms that extend well out from the core. From Earth, the galaxy appears to be more than 3 degrees across — remember, there are 90 degrees in a right angle, and 360 degrees in a circle; astronomers use angular size as a way to measure how big an object is on the sky. The Moon is about 0.5 degrees across (about half the width of your thumb held at arm’s length), so Andromeda is about six times bigger—roughly what’s shown in the picture. It may not be exact, but I don’t think it’s that important that it be perfect. It’s close enough, and certainly is an amazing thing to consider. After all, Andromeda is 2.5 million light years away—25 quintillion kilometers* (15 quintillion miles)! It’s about 140,000 light years across (the Milky Way is about 100,000 for comparison), so even at that forbidding distance it takes up a noticeable amount of real estate in our sky. The Moon is only about 3,500 kilometers across, but it’s only 400,000 kilometers away. That’s a four-day ride via Apollo, but still a lot closer than even a nearby galaxy. Photo by Stephen Rahn. Click to enlunenate. The Andromeda galaxy in the ultraviolet, as seen by NASA’s GALEX mission. Click to hugely galactinate, and you want to, because wow. I’ll note that as I write this, on the first day of the new year of 2014, Andromeda itself is up and easy to see after sunset in the west for northern hemisphereans. By 8 at night it’s about 60 degrees directly above the western horizon. WikiHow has a decent guide to finding it. 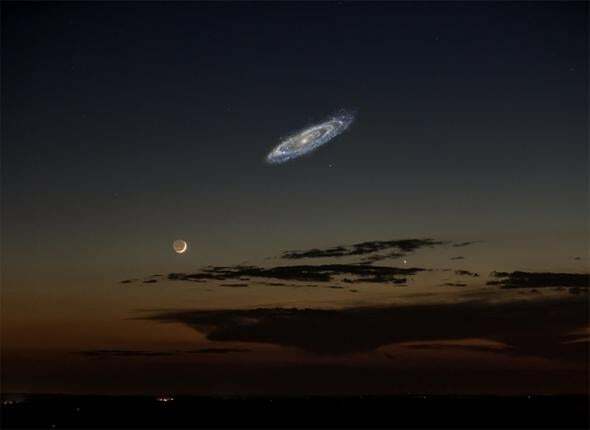 Or you can seek out a local observatory or astronomy club; if the Moon’s not up, I can guarantee they’ll be looking at Andromeda during their public nights. Ask if you can see M31 (the official name of the galaxy; the 31st object in Charles Messier’s catalog) for added geek points. And there you go. Not all viral memes are bad, wrong, misguided, or dumb. Some are pretty much right on the money, and can actually lead to a “gee-whiz” moment, and to more knowledge and understanding. How about that? The Internet really is good for something after all! 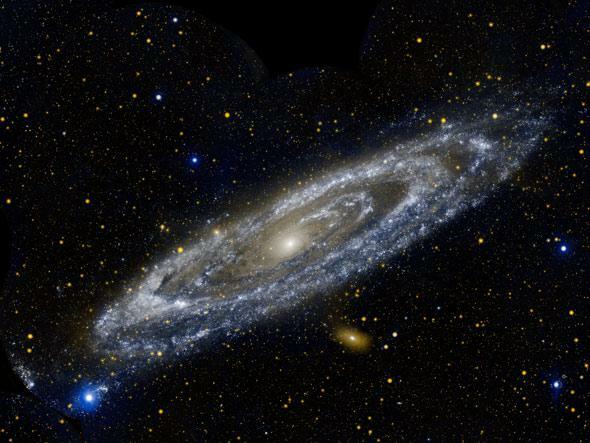 *Correction, Oct. 31, 2015: I originally wrote that Andromeda is 250 quintillion kilometers away. What’s a factor of 10 between friends?